Posted On Mon, 12 Jan 2009 02:26:00 +0000. Filed in family, travel. By Vaibhav Bhandari. 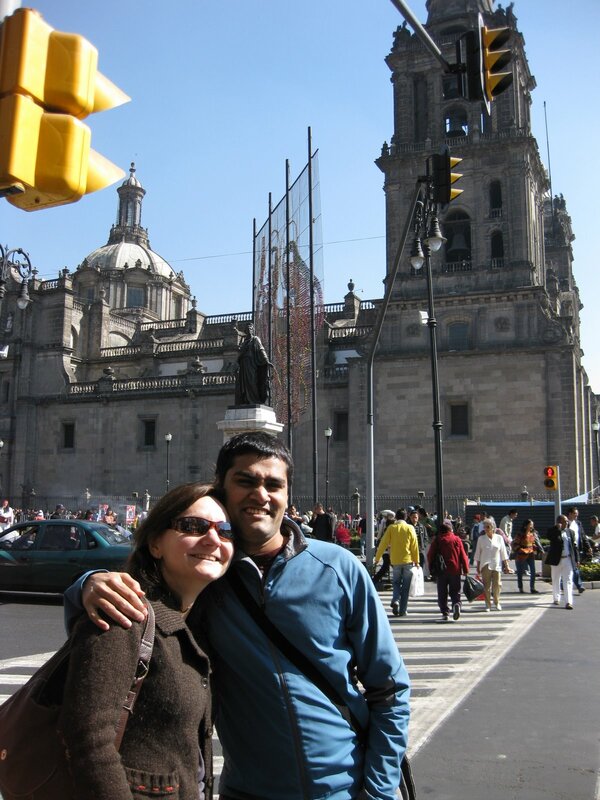 This Holiday season myself, Maris and Vaidehi spent some awesome time in Mexico. In the few paragraphs here - I will touch upon some of the great aspects of our trip. Well, Why Mexico? Because it is warm, when its really the beginning of winter and gloom in Seattle and North America. I wanted to be in some place warm, I was up for doing a cruise but Maris want a more immersive experience and Vaidehi wanted to buy stuff :). In our, 11days in Mexico we primarly tried to cover the central plateau. We started with the big bad Mexico City. Lonely planet and friend has suggested that the city is really a crime zone, and make sure you dont use the bug taxis. We were very careful of that fact, we just used the taxi’s from a authorized center or calling the cental number. We stayed in Centro historico district in Hotel Gillow, it was a very great and convenient place. Centro historico was the place to be, the Zocalo had a huge ice rink (apparently world’s largest outdoor rink) and the citizens lined up from 9 in the morning to enjoy their government’s gift! Over the three days in Mexio city we thoroughly got acquainted with Mexican history and culture. I read a few pages in to the book “Mexico”, it really laid out the lay of land from Teotihaucans, Aztecs , Mayans, Hernan Cortez, French, to Mexican revolution, General Santa Anna, to the PAN, and gave a perspective of why the current PRI gorvernment is so unique! We thoroughly enjoyed the vegetarian food in Mexico City, especially the Restaurant Vegetariano on Madero and Cafe Vegetariano in Zona Rosa. We took a day trip from Mexico City to the ruins of Teotihuacan. The orginal plan was to go to Patzucuaro but Maris and Vaidehi were more interested in the Monarch butterflies and they already did a tonne of Dulce and Artisanians shopping locally. So we headed the to santctuary and man! it was a million of butterflies, simply outstanding experience. Vaidehi and Maris - fell a litle ill do we decided to take a rest day. Go do some grocery shopping and cook at home - ! Maris made awesome soft tacos… and hey my side dish (yet to be named concotion comprising kidney beans…) was amazing…as Vaidehi will vouch…. We headed from Morelia to Zinhuatenjo…lovingly called Zihua just near the popular criuse ship base of Ixtapa. The bus ride to Zihua was very scenic..i never imagined that Mexico would have such a variety ..coming down from central coast to the sea level brought in the much needed and sought after warmth. Our hotel was right on the beach playa madera. I loved this beach the most (compared to the other much commercialized ones), for next three days i was busy catching the waves :). We took a small trip to neary by Manzillino beach which has coral reef just near the beach and did some snorkelling, man the girls went mad…. they just didnt want to go home. I gave up after an hour, but Vaidehi and Maris snorkelled for like 2.5 hours!! It was lovely, colorful and warm!!! On our last day, we did a tonne of shopping in Mexico City (Centro Historico), some cute silver jewellery and Tequilla…. 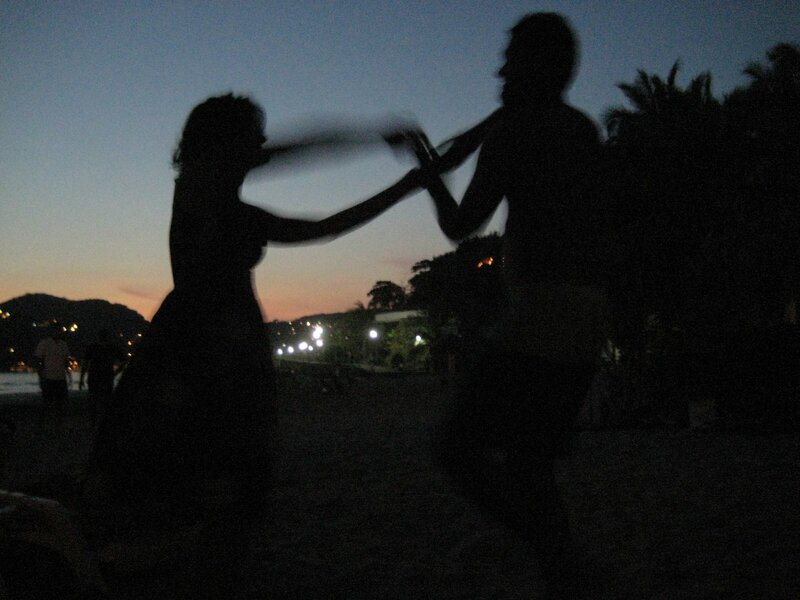 To summarize, it was a really great trip - we indulged in the histroric, artistic, rural and beach Mexico. It was nice to see, that in this third word country the state of toursim is really a notch up 0 - the buses were we took were really comfortable, hotels very tuned to the traveller and people very helpful! It was surprising that with very little spanish between myself (I specialized in numbers) and Maris (she specialized in directions), we could navigate the Hispanic world and have a great time, may be this calls for a revisit - sometime in future …….